You can get better results on your website with the addition of video making the DOCS Patient Education Videos a great enhancement to your site. Adding video helps to create a more intimate relationship with potential patients while informing them of the benefits of the services you provide. The Bloomsberg BusinessWeek published an article about the benefits of using video on your website that include search engine optimization, increased sales and traffic not to mention patient education. 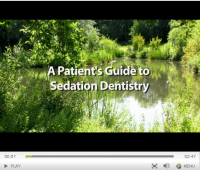 To support you in educating your patients, DOCS now offers three video options that present the benefits of Sedation Dentistry, Cosmetic Dentistry and Implant Dentistry, DOCS! Each video is just under 3 minutes to encourage engagement and presents the life-changing benefits of these services. Some of them include patient testimonies. The Sedation video also comes in Spanish. To license one video is $99/year. Add the second for just $50 more. When you order, we’ll send you a custom piece of code to place on your website. You can also send us your webmaster’s email, and we’ll send the code directly to him/her and copy you, so you know it got there. Paste the code into your site. Video is an excellent adjunct to your website, and these clips will help inform patients about the opportunities your services offer. NOTE: Some states require the dentist to possess an active sedation permit before advertising "sedation dentistry." DOCS Members can check with our Regulatory Counsel for guidance.